I’ve been on a cat kick lately, I guess. Issues with the software that makes my tablet make lovely stick-figures, so I had to go low-tech. Old Skool! Isn’t it funny how you can hear supposedly smart people, like an NPR radio host, say “I was never good at math” when they have to add more than three numbers, but you never hear a mathematician, engineer or scientist say I was never good at writing or talking. I’ve recently read that modern Greeks pronounce μ as “me”. 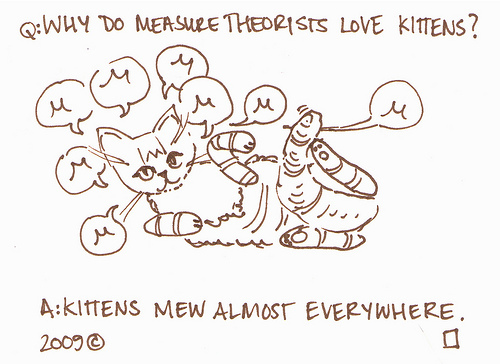 Why, then, are measure theorists so narcissistic? Haha, I get the joke but my professor uses a circled m instead of a mu.